Home Care Sheets & Guides Betta Fish Tank Size: What Size Tank Do Betta Fish Need? 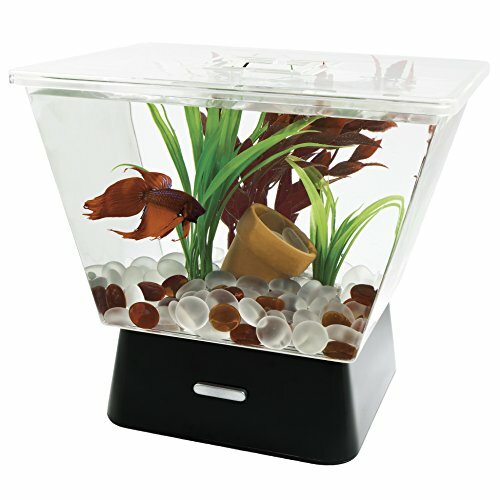 Betta fish tanks – From a quick glance at some of the products being sold you might think anything will do! From respectable tanks holding multiple gallons, to debatable small bowls and vases, and from spacious designer aquariums to the downright cruel and ridiculous iPod tank, the options available are truly endless. When it comes to betta fish tank size, the most common choice for beginner fish keepers is that of a small 1 or 2-gallon bowl or vase. The commonly held belief is that because a betta can ‘survive in a hoof print left in a rice paddy’ and can actually breathe surface air, they don’t need much room to live in. But keeping them in such small spaces will never allow them to thrive, rarely surviving past 2 years of age. Whereas properly caring for your betta in a nice, large aquarium can help them live for 5, 6 or even more years! In this article we’ll discuss the many options available for betta fish tanks. The size and shape, the good and the bad, what’s suitable, what isn’t and most importantly why! You’ll see our recommendations backed up with facts and logic, and then you’ll be able to make a well-informed decision when it comes to providing your betta a home. But before we discuss tank sizes, let’s think about bettas in their natural habitat. How Big Should a Betta Tank Be? The Truth is – The Bigger The Better! What Type and Shape of Tank is Best For Your Betta Fish? Whichever Tank You Choose, Don’t Forget a Lid! Betta are found in rice paddies and swamps in Thailand, Burma and other countries of Southeast Asia. While there are dry seasons and these bodies of water can dry up, the notion of betta fish surviving in 2 inches of water held in the hoofprint of an ox or small puddles are vastly exaggerated and not as nature intended. Rice paddies are large bodies of water with vast networks of waterways and channels and this is their natural habitat. The shallow, calm water is nice and warm from the sun, and plants sway gently in the slow current, giving lots of places to hide from predators. They have plenty of food to choose from too – meaty treats like fish fry, crustaceans, insect larvae and minuscule worms. Sounds nice, doesn’t it? More like a fancy resort in the Greek Islands than a glass vase on an office desk. Welcome to the Gamma Sigma Spa for Alpha Beta Bettas. So, what’s an eager owner to do? Obviously, you can’t flood your lawn to create a backyard rice paddy. What’s the alternative? The good news is with a little forethought and knowledge, it’s easy to set up a betta-friendly aquarium. Although there are many moving parts, such as substrate, filtration and more to decide on, perhaps the most important single decision in betta fish care is getting the right size tank. And that’s what the rest of this article is about: The best betta tank size for you and your fishes needs. This is a very hotly debated topic, with many opinions thrown around that often barely agree! So to cut through the noise and give more than just our opinion, we’re going to discuss the issue from 3 points of view. And remember, these recommendations are THE SMALLEST recommended. Always go bigger if you can. And this is the smallest acceptable, not what we recommend! It’s simply the smallest you can go to have any chance of even keeping your fish alive. A 1-gallon tank has such a small volume of water that fast temperature fluctuations are almost unavoidable and betta (all fish really) need a constant temperature to thrive. Such a small volume of water will rise and fall with the room temperature very quickly, whereas larger bodies of water hold their temperature stable – or at least take longer to rise and fall – so is better for the fish inside. There is also the problem of finding a heater small enough for use in a 1 gallon aquarium or less. Many have come to market in recent years for aquariums in the 1 or 2-gallon range, but options for smaller aquariums are severely limited. So achieving stable temperatures is incredibly difficult. Additionally, such a tiny volume of water can very quickly become toxic due to naturally occurring toxins. Ammonia is extremely toxic and is secreted into the water as a waste product by osmosis from a betta’s gills, as well as from the fish’s waste and uneaten food. In such a small space, ammonia levels can very quickly reach fatal levels and only water changes every single day can really prevent this danger. Finally, there is the argument of an enriched and suitable environment. Just how much can you put in a 1-gallon jar to mimic a natural habitat? How much substrate? How many plants? Bearing in mind that anything added takes away from the water volume so there will no longer be 1 gallon. So a 1-gallon really is the absolute minimum acceptable betta tank size, though we would never recommend one so small ourselves. Many expert keepers do keep numerous fish very well in 1-gallon aquariums, and many people passionately argue that a 1-gallon is all that’s needed. But we’re more in the 2.5 gallons+ camp ourselves. Although arguably the smallest acceptable betta fish tank size is 1 gallon, we strongly recommend that causal / beginner / amateur fish keepers opt for a 2.5-gallon aquarium as a minimum. The extra water in a 2.5-gallon when compared to a 1-gallon aquarium will mean ammonia and other toxic substances that build up in the water will always be less concentrated and therefore have a less detrimental effect on your betta’s health. The extra water will also mean smaller or less frequent water changes so it’s less work for you. A 1-gallon tank would need a water change daily, a 2.5-gallon tank perhaps every 3 or 4 days. Furthermore, the larger volume of water will mean the water is more able to hold a steady temperature and not fluctuate so quickly with the surrounding air temperature. It also means you have a far wider choice of suitable heaters that can be used with the aquarium. As stated previously, a stable temperature is very important for any fish’s health. 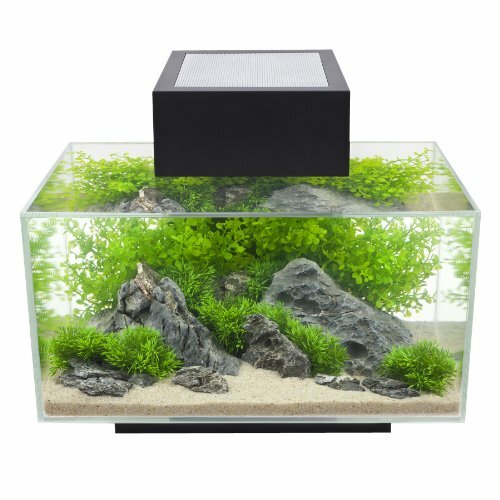 Finally, the larger tank will allow you to have many more options when it comes to personalizing the look, by adding decorations, live or synthetic plants and so on. A more highly enriched environment for your fish and a better-looking display for you to appreciate. Many people think to themselves: ‘I don’t want lots of work, so I’ll get a very small aquarium’. But small aquariums need their water changed extremely often and the living conditions for the fish inside are often terrible and so they die young. A larger, filtered tank makes it easier to establish a ‘cycled’ state whereby beneficial bacteria break down harmful toxins into far less harmful ones, meaning you can change the water less frequently and the ecosystem for your fish is far healthier. 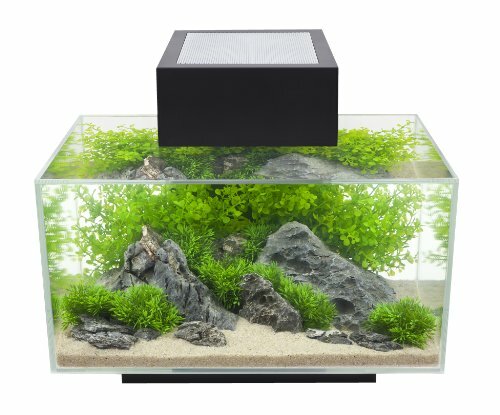 According to Aquariadise.com and others, 5 gallons is the minimum size tank in which a cycle can be easily established. And of course, the larger the tank, the more enriched and varied the life for your betta can be if you decorate it effectively. The larger your fish tank, the easier it is for water parameters to settle, and the easier it is for you to maintain a consistently healthy ecosystem, and the higher the chances for your fish to have a healthy environment to live in. The more water there is in a tank, the lower the concentration of any harmful substances that build up in the water. Also, the larger it is (and less stocked) the less maintenance work you have to do, and the higher margin of error you have for making mistakes in keeping your aquarium clean and healthy. Forget or not be able to change the water in a 1-gallon tank for a week and there’s an extremely high chance your fish would be dead. Forget in a 2.5-gallon tank? Your fish will likely be mildly poisoned, but hopefully still alive. However long-term damage will be done and their life will almost certainly be shortened. Don’t change any water for a week in a 20-gallon tank housing one betta? Well, you’re probably still right on schedule! Tons of people have the “betta in a bowl” at home and in their office. After all, it’s an easy, no maintenance pet, right? 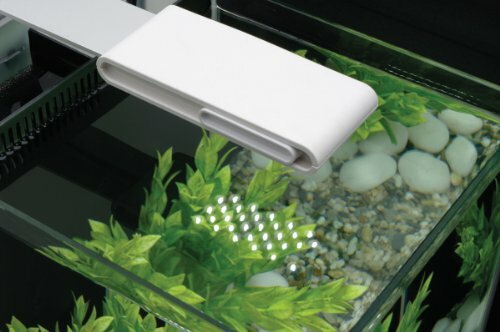 The packaging promises a “perfect symbiotic relationship” where the betta gets all his food and oxygen from the plant, usually a peace lily, and the plant survives on the waste from the fish. But is this really true? Are the fish happy in this setup? Could a small bowl possibly be an adequate home? The bowl is small, nowhere near a decent minimum size and often being somewhere between one third to one gallon. This tiny space just doesn’t give your betta enough room to live and swim around in. The water is likely cold as you can’t use a heater in such a small space because you’ll end up cooking your fish. Unless your typical room temperature is 75 to 82 degrees, your water just won’t be warm enough. The water will be dirty because a plant isn’t going to adequately filter it, meaning your fish is swimming around in their own waste, plus any waste the plant gives off when it starts to die off. There won’t be access to proper food. Remember how in the wild they would eat fish fry, crustaceans, insect larvae and minuscule worms? They aren’t meant to live off plants alone. They will – but only because they’re desperate for ANY food! There won’t be adequate access to air. The water will be almost stagnant, certainly oxygen deprived. Yes, they are known as ‘labyrinth fish’, meaning they have an organ to breath from the surface. But placing a plant on the surface of the water (such as the peace lily) makes it difficult for the fish to find room to breathe. These cramped conditions put a lot of stress on a betta. As a result, most that live in a tiny bowl or vase only live a year or less, whereas those who live in a properly set up tank will last 1.5 to 3 years, some as long as 5 years. There are, quite literally, thousands of different aquariums, bowls, and jars coming in all sorts of shapes and sizes that you could buy as your home aquarium. Many of which are marketed as ‘specifically for betta fish’. So how do you choose which tank is best? Thankfully, there are only 2 things you need to consider: Size and shape. Yes, you need a lid to prevent your betta jumping out, and also lighting, filtration, substrate, plants, and ornaments, but those are things you add to an aquarium and are subjects for other articles. For now – in this article – let’s just concentrate on the preferred size and shape for a betta tank. As previously discussed, 1 gallon is the absolute minimum to have any real chance of keeping your betta alive for any length of time. But you want to do better than that, right? 2.5 gallons is many experts ‘recommended minimum’ to have a reasonable chance of keeping your fish alive. But you should also choose to do better than that too. Get the biggest aquarium you can comfortably afford and can accommodate in the space you’ve allocated to it in your home. The more water there is which means it’s easier for you to keep it chemically stable. The more stable the temperature will be. The more room your betta has in which to swim and exercise. Lastly, the more room you have for ‘aquascaping’ – building out the tank with plants and decorations to make it look like a natural environment. Quite simply, bigger equals better. But how big should you go? That’s entirely up to you. But to give a figure, In my humble opinion, I’d say a good 10 gallons is nice, with 15 to 20 gallons being ideal. The shape of the tank isn’t as important as the size of the tank. Betta fish like to occasionally breathe air from the surface and so are happiest when they have easy access to the surface. Therefore, wide and long is better than thin and tall, to provide a greater surface area. If you intend to keep live plants, taller aquariums are harder to light sufficiently and will need more expensive and stronger lighting. So shallower is easier. Longer tanks provide more hideaways from the current produced by water returning to the aquarium from a filter or produced by air-stones than do tall and thin models. Longer tanks are easier to maintain than very tall ones because you’ll find it far easier to reach into the bottom, to fetch dropped items, re-root plants or use your gravel vacuum during a water change. So although shape isn’t as important as size, we do recommend aiming for wider, shallower tanks as opposed to thin and very tall ones. Whichever tank you choose, you absolutely must make sure that you buy for it a lid! Part of a betta’s charm is they can jump out of the water. Mind you, this is only charming if catching food in midair, or escaping to better waters in the wild. It’s less amusing to find your beloved pet doing the perfect corpse pose on your yoga mat when you come in for some early morning sun salutations! 2.5 gallons is our recommended minimum tank size for betta, though a 5 gallon aquarium is preferable and if you can stretch to it, a 10 gallon or more will give your fish a much higher chance of a happy long life. And as a bonus, the bigger the aquarium, the less work for you to maintain it. Despite what you may read elsewhere, tiny vases and bowls are not a suitable home for a betta. It’s near impossible for you to maintain a high water quality or to keep the temperature stable. And your fish will feel the consequences. Decent size tanks are very affordable these days. Buy one. It’s possibly the best thing you can do for your fish. Great write up and some helpful information, I think personally a 1 gallon tank is too small for them and it’s always better to go for larger tank to give them a bit more freedom. You do have to be careful with Betta’s in terms of mixing them with other fish but I just have mostly aquarium snails and plenty of plants with mine and it looks great. Looking for information on tank mates for a beta fish. Would a crawfish be okay as a tank mate?? I certianly wouldn’t risk it. The crayfish would very, very likely nip at and tear the bettas fins, if not the entire fish! It’s possible they would keep away from eachother in a large enough tank, but really, no, it’s just not worth the risk. I would say they are incompatible as tank mates. You can click here to see some suggested betta tank mates.